I have been having internet issues and have had tons of trouble keeping my connection, so my commenting, posting and everything has been put on hold for a bit here!!! Today I wanted to show you a little gift I made for a friend for her birthday. This is a CD book. I know she has a very high end camera and takes great photos, so I thought a pretty place to keep her photos might be fun. I covered some chip board with EK Success DP on the outside and inside covers. I bound it with 3/4" O Wires, and used my Zutter Bind It All. 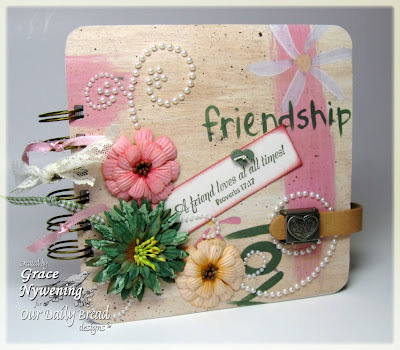 I made a little tag using a sentiment from Our Daily Bread designs Friendship set. I added some ZVA Creative pearls and some Prima flowers, ribbon from my stash and the Zutter Heart Closure. On the inside I added a little pocket with a paper I lined so she can list what is on each CD. The CD pockets themselves came from a local fun store that sells a little of everything. A CD book is such a great idea--I would never have thought of that on my own! It turned out really, really cute, Grace! Oh sweet Grace, this is the most wonderful gift idea! I love it! How thoughful of you! And what a way to dress that chipboard! Thanks for playing again this week at Practical Scrappers! Hi Grace! What a gorgeous CD book! Your friend is going to love it. All of the details are wonderful. Thanks for joining our challenge at Practical Scrappers. Wow, I absolutely love you book!!! Great job on the challenge! Thanks for playing along with Practical Scrappers! Wow! So beautiful and so creative! Thanks for joining us at Lexi's Creations with this lovely work! 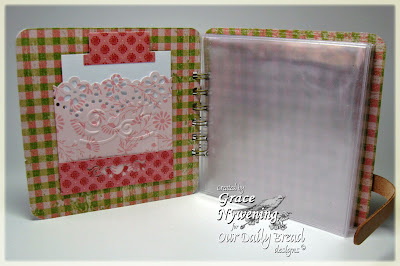 What beautiful Grace,i love your papers and details. what a great idea to hold photo CDs, Grace! I really need to make one of these & then make a backup of all my photos on CD! Oh she loved it..:) I already have it half full. Good luck with your internet.How frustrating.. We missed you today and need to reschedule..I bought enough for both of us..LOL..Have a great weekend. I love your ribbons on the loop part. Oh, and a tiny heart on the clasp! You think things out so beautifully Grace, and then you have the talent to make your vision a reality! You are a blessing to me...and anyone that looks at your work, of that I a sure. That inside flap is beautiful! This is gorgeous, love the flowers and pearls. This is gorgeous Grace!! I am sure Dawn loved it!!! What a great idea and beautiful design!! Perfect place for all her beautiful photos. You rock GF! Praying your internet issues get fixed soon!! TTYS!! Miss you! What a great idea, I love that and may have to borrow that idea. Hope your internet connection is fixed soon!